Spoiler season for Ravnica Allegiance has just wrapped up! Some people say it’s the most wonderful time of the year, though if that’s true, we have five more most wonderful times of the year for the future sets in 2019! We’re full steam ahead on Ravnica Allegiance and it’s looking like another crazy set. Some folks were torn about Guilds of Ravnica, but personally, the “Return to Return to Ravnica” block has me very excited. It says a lot about the set when I, Mr. Selesnya, end up building a brand new Izzet deck with Niv Mizzet, Parun at the helm. Ravnica Allegiance is no different. If there is a single color I play the least in my decks, it easily is black. I just never have enjoyed the ‘give a little, get a little’ playstyle much. It’s just not me. Check out this lovely lady. Holy dang. Teysa has gone through a few iterations now, and this one to me just leaps out as the wildest. A Panharmonicon for death triggers is certainly unique and definitely powerful if you know how to abuse it. I can definitely think of a few ways to do just that, especially with the recent finish of an on-color budget Modern deck that recently had a solid tournament finish itself! Let’s check out this week’s inspiration for our crossover decklist. Yea, when I said budget, I meant BUD. GET. I honestly have no idea how this deck did so well, but I’m not going to argue with the results. This deck actually has a few things going on for it, namely churning out tokens with Lingering Souls and playing a little bit of a disruptive gameplan with Tidehollow Sculler. This is a fine start to any deck, especially one that we can build to abuse with Teysa Karlov. Tidehollow Sculler gets terribly overlooked in BWx decks in Modern. It’s not a bad body, and it throws folks off their gameplan. It’s a great enough sideboard card that a friend of mine who now is on the Wizards of the Coast Play Design team would often default to playing a full playset in any deck he could. He’s making our beloved card game now, so maybe he’s onto something. How about all those tokens we need to acquire? Those are easy. With this grindy Aristocrat-y build, it’s all about getting creatures killed, which makes this a great time to bust out a card that has always tempted me. Only played in a hair over 2,500 decks on EDHREC, Twilight Drover is a little mana-intensive, but has always had so much darn potential. This could be the time it breaks through for me. Sacrifice a token to Sadistic Hypnotist to put a counter on the spirited Drover, pay a few mana to replace the creature and give it a buddy. Seems alright to me! I don’t think I’m too out of line in saying that Battlebond from last year was an absolutely awesome set for Commander players. Some solid reprints and great new mechanics. I particularly enjoyed the fixing of the Partner mechanic to be “Partner with.” The flavor fit nicely and it prevented generic, value-oriented pairings from becoming even more popular. One of these new Partner pairs I’m particularly intrigued to see in new Teysa Karlov decks is Regna, the Redeemer and Krav, the Unredeemed. Krav, the Unredeemed satisfies several roles in the deck: a sacrifice outlet, a draw engine, incidental lifegain, and he evolves into a beater very quickly. Regna, the Redeemed isn’t quite as powerful, but she does feed into Krav quite well, and Teysa even gives her tokens a nice ability boost. Regna, the Redeemed has some pretty key text on her as well, reading “at the beginning of each end step,” meaning there’s potential to trigger her four times per turn cycle. Another wombo-combo that I’m very excited to see pan out in the near future is the insanely terrific new card, Smothering Tithe, combined with Revel in Riches. Smothering Tithe this is ridiculous! It gives mono-white decks a way to keep up in the ramp game while the blue decks draw all the cards. It’s just a wonderful power level, and I’m so glad to see this come out right on the heels of Revel in Riches. Just in case our primary plan of sacrificing tokens and creatures for value fails, chances are we’ll have plenty of Treasure tokens to help us along with a Plan B, along with potentially winning the game as a Plan C! Man, I am just way excited for this thing to tax the rich and give to the poor – the poor, of course, being me! Did you see it? Let me just point it out for you and save us all time. Many probably didn’t even know Dawn of the Dead was a real card; it’s supremely obscure. Currently showing up in only 543 decks on EDHREC, this card is a gem. Because Teysa sacrifices so many creatures, a fun subtheme to include will be reanimation! Bring back those awesome creatures to re-double-trigger their death effects! When tinkering around with a list of recursion engines, Sheoldred, Whispering One was an obvious choice. However, I really struggled to put that card in my initial list, as it can be dreadful to play against in the most unfun way possible, and quickly draws the ire of your opponents. Thankfully, Dean came to the rescue with Dawn of the Dead. It gets your creatures back on each of your turns, and though it would exile them at the end step, if you sacrifice the creature before the end of your turn, it will go right back to the graveyard, ready for you to recur and sacrifice and recur and sacrifice all over again! Perfect for the chain of events we want to set up, without any of the feel-ads that can be inspired by staring down a Sheoldred. A+ find there, Dean! And finally, my version 1.0 early list for Teysa Karlov! 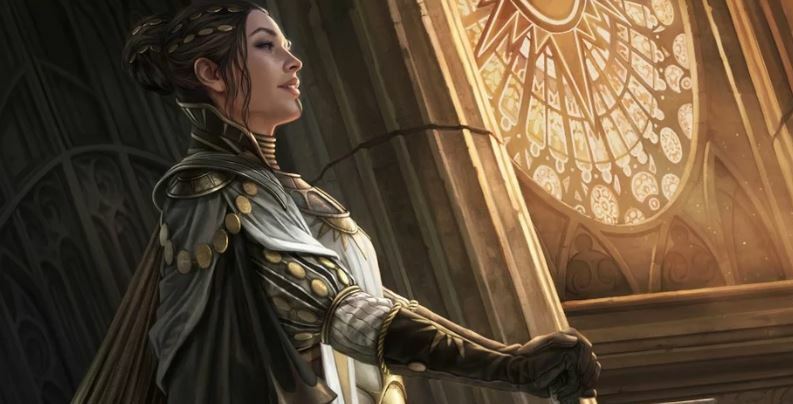 For someone who has never played a straight-up Orzhov deck before, I can’t wait to try this out and jam some games. It looks like a blast with lots of fun little interactions. Like the original 60-card list’s Doomed Traveler and Lingering Souls, we have tons of ways to make tokens after death, like Flesh Carver, Hangarback Walker, and Elenda, the Dusk Rose. In addition to the hand disruption in the original list, we’ve piled on more effects like Reliquary Monk and Archon of Justice to mess with our opponents’ plans. The original deck used Soul Warden for additional lifegain, and here we’ve swapped them out for Blood Artist and Zulaport Cutthroat effects. Black Market looks like an absolute house. Finally, we can wrap up the late game with all-stars like Kokusho, the Evening Star and Massacre Wurm, whose additional triggers will do a frankly silly amount of damage. What other cards and crazy interactions would you recommend for Teysa? She’s the new kid on the block (again), and there are some powerful tricks up her sleeve! If you want to hear more thoughts about the new new iteration of Teysa, check out our Teysa deck tech on the EDHRECast, and as always, please share your thoughts in the comments! Thanks everyone!